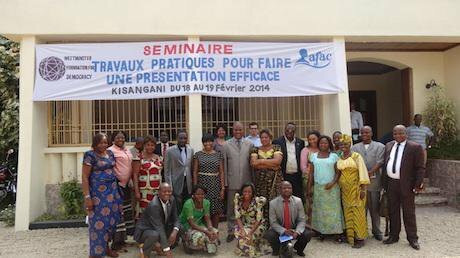 WFD organised a training workshop for women in Province Oriental, DRC. Westminster Foundation.One of the recommendations from the study completed for the Swedish International Development Agency (Sida) in 2012 by my colleague at ODI, Tam O’Neil and I, was that the parliamentary strengthening community should “move the field forward by conducting or commissioning evaluation work that can address identified knowledge gaps and build the evidence base in a more systematic and rigorous manner.” It is exciting to see the Westminster Foundation for Democracy (WFD) and the University of Oxford collaborating to do just that in this project on ‘The Political Economy of Democracy Promotion’. Everyone knows or talks about the fact that context matters, but the policy brief on ‘Navigating trade-offs in parliamentary strengthening’ does a good job of examining what the concrete implications of this might be, focusing in particular on the longevity of the legislature and the nature of social cleavages in a given country. The brief touches on many important issues, addressing questions and lessons that have emerged in parliamentary support over the years. It is also highly practical, clearly geared towards providing programmatic guidance. The various lessons and recommendations that have emerged in parliamentary strengthening are often presented as coherent and mutually reinforcing, but this may not always be the case. As such, the discussion here about trade-offs is an important one, encouraging donors to recognise and be more upfront about the fact that there is no one single way or formula for doing things. Different approaches will have an impact on other aspects of the political context, generating potential tensions and dilemmas. So it is crucial to understand that all good things don’t always go together automatically and choices need to be made, and to be aware of any potential implications. One of the most important contributions of this brief (and hopefully of the project as a whole as it continues to evolve) is to help think about what tailoring a programme to context actually looks like. The framing of a more tailored approach around institutional as opposed to issue-based parliamentary support is particularly useful, based in part on how young or well-established a parliament is and what type of approach (or combination of approaches) might be most effective. The extent to which the second contextual dimension – social cleavages, which is clearly extremely important – helps guide the selection of projects/programs is less clear from the brief, beyond highlighting whether a setting might be too contested to remain involved. I am not sure whether the distinction the brief makes between identity and ideological cleavages is that useful. To my mind it is extremely difficult to divide social cleavages as either ‘identity-’ or ‘ideology’-based, as these two are in fact closely interlinked. The formation of identity often then entails the development of an ideology around it to justify it (e.g. apartheid in South Africa or the subjugation of women). Perhaps what the authors of the brief are trying to get at is programmatic as opposed to more group- or identity-based political differences, but this needs to be developed some more. Something that I found very striking and that seems to be reinforced by other research on what works in development is the kind of difference that international actors can make when they help to foster or facilitate a space for dialogue/engagement among stakeholders who would otherwise not come together (such as the example of Dyfcoside in the DRC). This is not the language that is used in the piece, which focuses instead on issue-based donor support. But clearly providing a space to discuss a given problem or issue among a diverging set of actors is crucial to this. It made me think of the kind of ‘multi-party dialogue’ work that organisations like the Netherlands Institute for Multi-Party Democracy (NIMD) do, and it made me wonder if the project could provide more examples of what kind of support might be more appropriate in divided settings, and whether this focus on ‘inclusive multiparty dialogue’ helps. It was also surprising to see relatively little mention in the brief of the underlying political nature of parliaments and the need for parliamentary assistance to better understand these power and institutional dynamics if parliamentary development assistance is to be more effective. As noted above, the piece clearly talks about context and the need to adapt and tailor projects/programs to different settings. But much of the discussion on institutional-based support to parliaments in particular remains largely focused on issues like lack of skills, technical capacity and/or knowledge, and on the formal workings and proceedings of parliament to ‘make it work as an institution’. These are all undeniably very important, but the reason parliamentary support has proven so ineffective over time is precisely because it has failed to engage with informal institutions and to understand the incentives that drive parliaments and parliamentarians. To use a metaphor developed in our Sida report, institutional support should not simply be about what the car looks like, but also essentially about the driver(s), road conditions and the like. There is a mention in the brief that issue-based approaches have been brought in precisely to better address incentives, but this question of power dynamics, informal institutions and behaviour is much deeper and needs to be addressed much more fully across different modes of parliamentary support provision. It is curious that, despite how diverse the field of parliamentary strengthening is, the menu and set of activities international actors undertake tend to look remarkably similar across countries, irrespective of the contexts in which they are implemented. So one question that I have is whether there is evidence emerging of where efforts that are truly distinct have been tried in different countries, and whether they have worked. What would a more politically smart, politically informed parliamentary strengthening program look like? Is it only issue-based support that can help with that? And are issues-based approaches automatically more politically informed and attuned to context? This would be a fascinating area for this project to look further into as it tries to drill deeper into the question of how it is that context matters specifically and what the implications of this might be for genuinely tailoring programmes to those contextual realities. ‘Navigating trade-offs in parliamentary strengthening’ also talks about the need for donors to be more innovative and open to risk, which is very welcome. It fits very well with existing research that suggests that the parliamentary strengthening community should focus approaches that are more flexible and adaptable, better attuned to risk, and better able to focus on qualitative dimensions of parliamentary effectiveness. This will help international actors to become brokers of meaningful change and design programmes that engage not only with the formal procedures of parliaments and the need to build capacity and skills but, perhaps more importantly, also seek to understand the incentives that drive parliaments and parliamentarians and influence changes in their behaviour. But this then makes the following question even more pressing: What would more innovative and risk-tolerant projects/programs look like? And what would these imply for the way donors currently work, whether they need to change their ways of working to support more innovative programs and how they would do this in a flexible and adaptive way that embraces risk – without causing harm? Lastly, the discussion of political parties in the brief is also encouraging and the fact that there is a need to bring parliamentary and political party support into much closer alignment. In order to understand parliaments and parliamentarians, it is essential to understand how political parties function (or do not), as the two sets of institutions and actors are inextricably linked. If WFD has been trying to do this, it would be fascinating to learn more about how this is being done, and if it is in fact proving more effective.